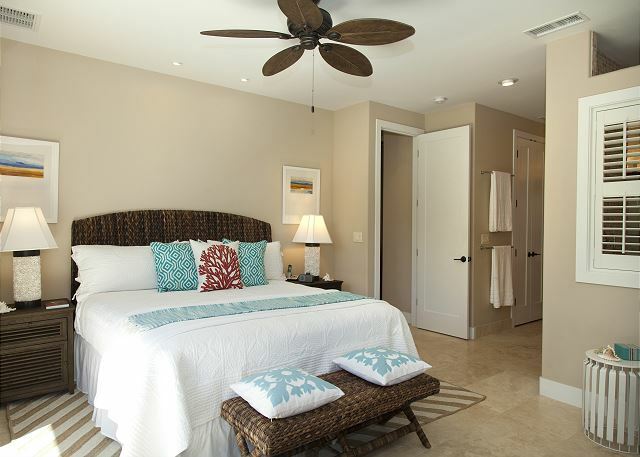 Aloha, and welcome to “Hale O’Honu,” House of the Sea Turtle, a brand new and beautiful 3 bedroom/3 bathroom cottage that offers everything that you would ever desire on your Big Island vacation in Mauna Lani. 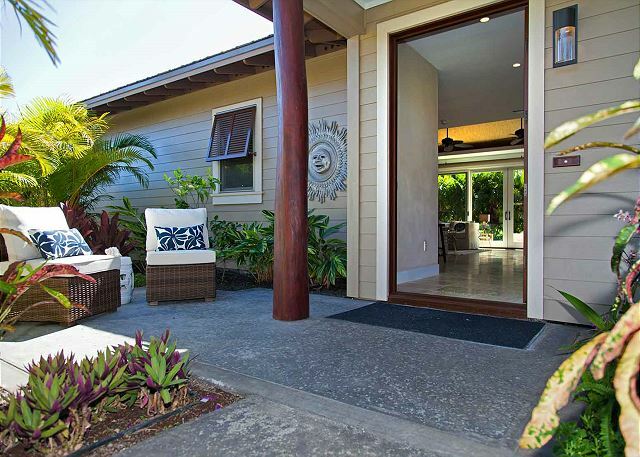 The house has a modern Polynesian design and a spacious, 1700 sq. ft, open floor plan with beautiful travertine floors throughout and a fully equipped gourmet kitchen, outfitted with granite counter tops and stainless steel appliances. 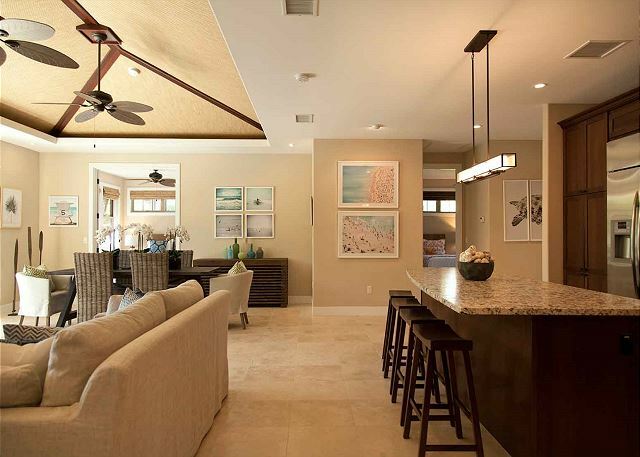 Two private backyard lanais (which open from large sliding glass doors off the living room and master bedroom) are furnished with stylish lounge chairs and a BBQ, and are surrounded by lush, tropical landscaping, giving a sense of tranquility and calm. 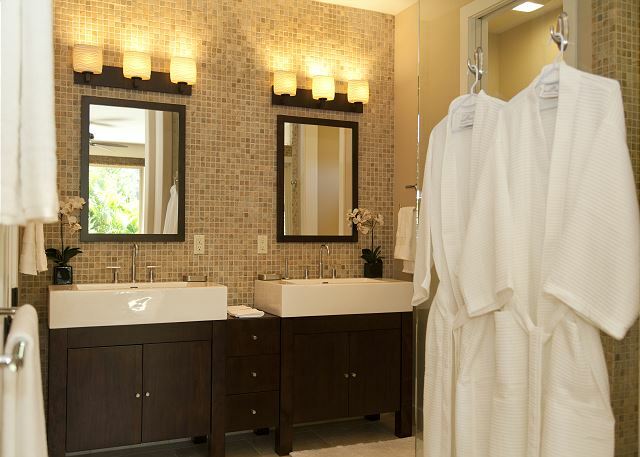 There are two bright and airy master bedroom suites, both with spa-like, en-suite bathrooms (large soaking tub, generous walk-in showers, double sinks and vanities) and walk-in closets. One master offers a plush, Cal. king bed while the other offers two XL twin beds that can be joined to make a king if desired. The third bedroom has a queen and also has an en-suite bath. All of the beds are outfitted with luxurious 600 thread count sheets and beautiful cotton/linen quilts, and all of the baths are stocked with white, fluffy, 100% cotton towels. The bedrooms are also all equipped with flat screen TV’s with the living room boasting a state-of-the art, 75 inch flat screen, Smart TV - just lower the automatic, dropdown blinds and you have a screening room that makes for the perfect movie night. Netflix is available free. Guests of Hale O’Honu get full use of KaMilo’s spectacular, 2 acre Recreation Center, which is about a 90 second walk from the cottage. The Rec Center offers a gorgeous, mosaic tile lap pool, a large lagoon style family pool, a kiddy wading pool, two Jacuzzi spas, a workout building with exercise machines, free-weights and showers (with separate men’s and women’s locker rooms). There is also a large, covered pavilion adjacent to the lagoon pool with a kitchen, BBQ, sink and fridge – a perfect place to have a meal, host a party or enjoy a relaxing cocktail (or two). 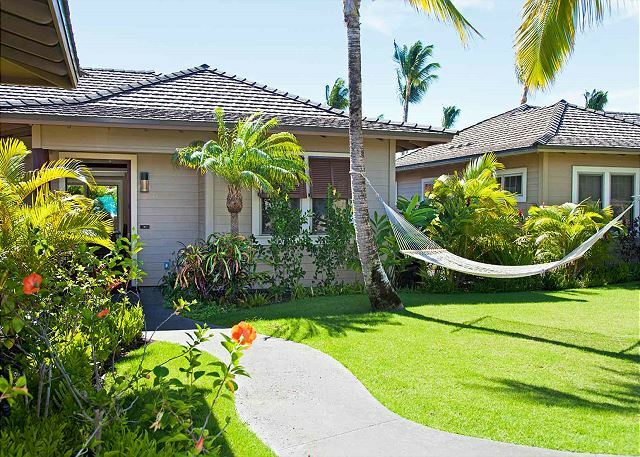 The private Mauna Lani Beach Club (a gate card that we provide our guests allows entrance) is only a couple minutes drive away and is another perk of renting Hale O’Honu. It is a picturesque white sand beach - a true oasis - perfect for snorkeling (*one of the best snorkel spots on the whole island), swimming, kayaking and stand up paddling (*there is a fully stocked rental kiosk at the beach). Or, if you just want to relax, the Beach Club offers cabanas and lounge chairs (free of charge), so just grab your favorite book and you’re set. 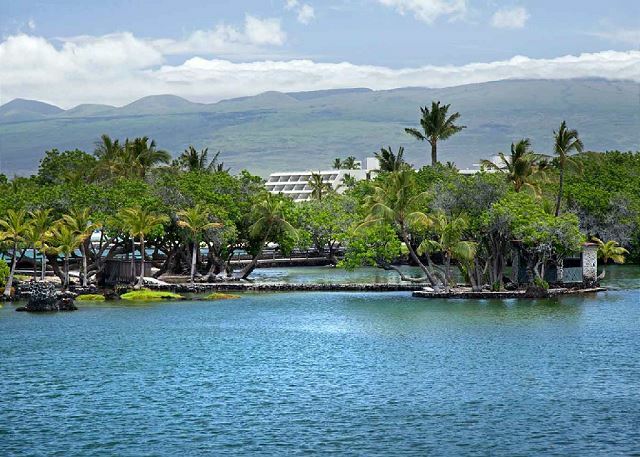 There is also an excellent restaurant and bar at the Beach Club where you can eat and take in the view of nearby Maui or order your food to go and picnic on the beach. And sunsets here are just breathtaking! Our family of four just spent 9 nights at this property.If you like Kohala, it's a great location, near beaches, golf, etc. The property itself is lovely. Big open living space with high ceilings. Decently equipped kitchen. 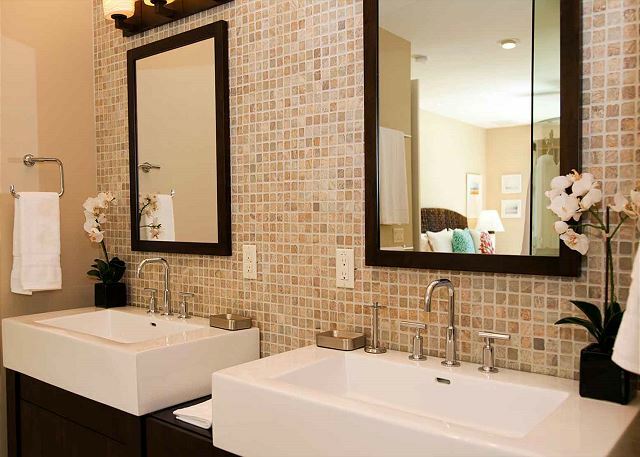 Three bedrooms each with its own bath. really comfortable mattresses and bedding. Beach gear in the garage. Super clean. Very responsive manager. Not much in the way of private outdoor space - there's a small lanai in back - but it's a 30 second walk to the pools/gym/pavilion. Definitely recommend. Great unit- appreciated the beach supplies in the garage. Close to amenities centre- pool and gym. A bit dark due to location, but well appointed inside. This spot worked well for our family of 5 adults and a 3 year old. The common facilities (like the pools) are very close by. Excellent landscaping makes the unit feel very private although it's in the middle of Ka Milo. Well-equipped, comfortable, stylish, convenient to activities and the Foodland. Just got back from 2 weeks at KaMilo 406 and loved it. Check-in - if you could call it that - was perfect; instructions had been emailed in advance and were clear. We didn't need to talk to the property manager the entire time because the house was stocked with everything we needed plus more! Beach chairs, mats, pool floats, snorkel equipment, all the kitchenware, dishes, and flatware we needed were handy. The house is so close to the Foodland that it was super convenient to pick up food for lunch or dinner whenever we wanted to cook in. Beds and couches were comfortable and the living room TV is enormous! Location can't be beat - a few minutes to Waikoloa Beach Resort, Hapuna Beach, Waialea Beach, Black Sand Beach (on the other side of the Mauna Lani resort; this one is pretty cool - highly recommend, but go early as parking passes are limited), and of course, the Mauna Lani Beach club pass that is included with the house. Pools were nice and 2 minutes walking from the house, but we didn't spend much time there. Lap/Quiet pool was rarely crowded. Honestly, if I could buy the house with the contents, I would! It's a great place to stay! Great property and the beach access was really nice. We also enjoyed the book of local attractions and activities. Bikes, snorkel gear and Netflix either not there or not useable. Relaxing, quite, and great amenities! What wonderful person to meet with!!! I had great experience with this property and service they offered me. Many thanks to Shiwota san!! We loved the house! It was perfect for our family. We had a wonderful family vacation at KaMilo 406. The house came with a high chair and pack n play and the garage had a great supply of snorkel gear and sand toys. The house was clean, new, comfortable and fully stocked for everything we needed. The pool area was huge and beautiful and the beach access had great snorkeling and swimming. The rental company was extremely helpful and streamlined the entire experience. Traveling with a baby can be very difficult but the rental had everything we needed for great days at the beach and calm restful nights at the rental. My wife, adult son, and I spent two wonderful weeks at Keanu Cottage in late January to early February. The cottage was very spacious, quiet, and well appointed. Top end appliances made cooking very easy. 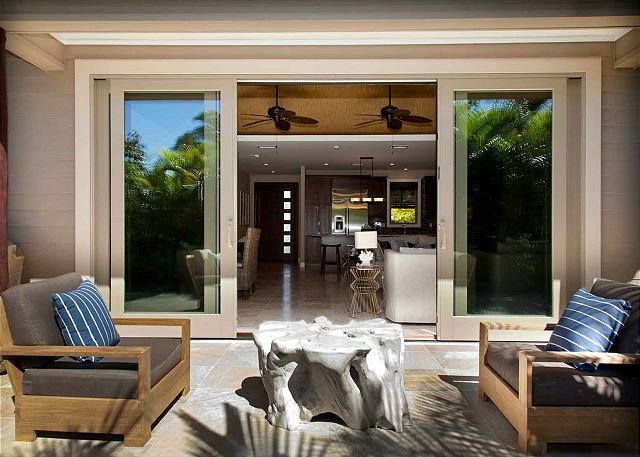 The main and bedroom lanais offered comfortable outdoor space for R&R. The unit was a two minute walk from the rec center, adult lap pool (best outdoor pool I've ever used and I've used many in my days) and hot tub which we used daily. I could not recommend this unit enough. Had a great time here at Kamilo 406 - the rental unit was just as advertised. House is immaculate in every way and clean! Very quiet area with nice grounds. Pool was a bit cold for my kids and hot tub broken for 1 week of our stay but not a big deal. Shig from the management company was excellent and fixed a few issues we did have very quickly. would recommend this spot to anyone looking for a quiet place with or without kids. This is a beautiful home, stocked with every imaginable need. We with our adult children enjoyed a very special Christmas in this home. As always it was great, beautiful area and a great house for us and our family . We loved our stay in this beautiful home. It is extremely comfortable and has everything you could need. The rooms were all perfect with their own bathroom, and we enjoyed sitting out on the back patio in the mornings. There were great beach chairs and toys for our daughter to use, as well as a pack n play and high chair for her at the home. We loved the location in the community with the pool (that was nevery very busy) and the private beach. We also enjoyed the beach club restaurant that was right there. Close to some food options and a Foodland grocery store. I'd go back in a heartbeat!! We rented this property with another couple, and the setup of the Cottage was idea. Great room and kitchen made up the centrer of the space with the bedrooms off to each side. The back patio was private and felt very secluded. All of the amenities were in new condition, and the unit is only one property removed from the pool and exercise facilities. There were plenty of beach towels, and we appreciated that there were quality boogie boards, beach chairs and umbrellas in the garage for us to use. Shig and Maya were friendly, responsive and a pleasure to deal with. Never mind recommending to friends, KaMilo 406 is definitely on our list to come back to! I would definately recommend this rental. Everything was as pictured. The location was great and the manager Shig was very helpful and friendly. Everything was in tip top shape. Beautiful home. I definitely would stay again! Loved the whole experience. Very pleasant. We enjoyed walking to the Fairmont Orchid for brunch, working out at the fitness center, having access to the nearby beach, reading by the pool, and being able to do our grocery shopping by walking to the nearby market and back. The home served as a jumping off point to travel around The Big Island. The house is In a well situated, beautiful resort with a convenient shopping plaza. There is both a beautiful beach and two great pools on the property. The house is roomie, well appointed, clean, comfortable with great facilities. Most importantly, the beds are great. I would definitely come back here. My boyfriend and I were here in Sept 2016. Our experience was very consistent with the positive reviews - very comfortable and spacious new build, beautifully decorated and very easy access (a minute or two walk next door) to the large and well-designed pool area which was so uncrowded it felt private. Shig the property manager was very responsive and took very good care of us. Access to the property and guidance from finding the location to appliance use was all very straightforward. Very good value if a bit of a drive to the vibrant town of Kona; however we spent plenty of time off exploring the island anyway. We were very pleased with the rental. It was roomy, clean, comfortable for the six of us (two young ones). The location was good, close to all the amenities. I visit the Big Island often and usually stay at a resort. This year we chose to stay in a house and we were extremely pleased with this property. It was clean, beautifully decorated, extremely comfortable, and had pretty much everything that we needed. I was very impressed with the kitchen cookware and dishes as we prepared most of our meals at home. Thank you for making this such a lovely place for families to relax and enjoy the Big Island! We are looking forward to staying at Kamilo again in the near future.